BLF is at it again! 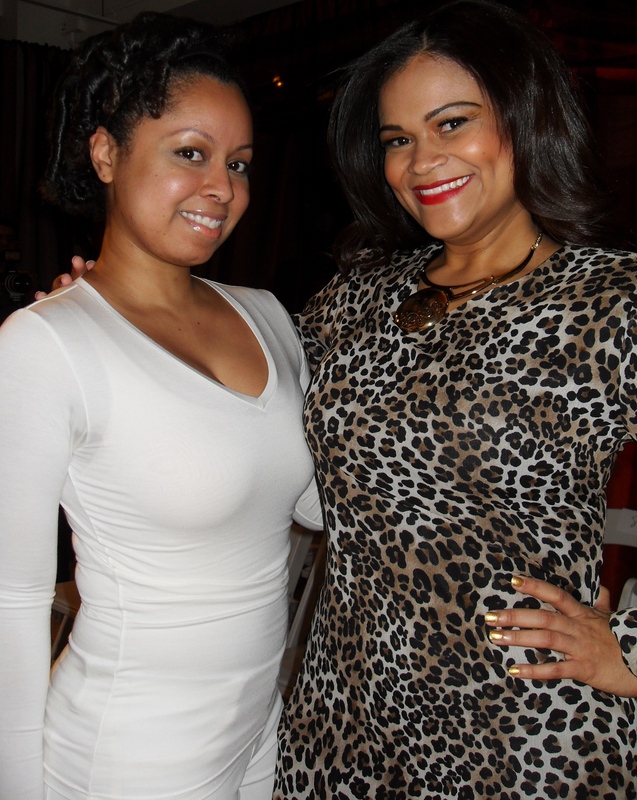 Check out my Fashion Week event coverage on the ever fabulous blog The Curvy Socialite! I had a chance to view Season 5 Project Runway Winner Leanne Marshall’s spring/summer 2014 collection (from the second row, at that! ), so click in for my review, photos and more! I checked…her hands indeed were a subtle shade of coral. Notoriously hands-on when it comes to getting her pieces the exact right shade, Project Runway winner (Season 5), Leanne Marshall saw a return to the bright colors and whimsical shades that her line has become known for. While Fall/Winter 2013 saw her experimenting with darker silhouettes and was better described as after-five than black-tie, Leanne’s Spring/Summer 2014 collection embraced the formalwear which has become her brand’s staple. Polanco holds a Bachelor’s Degree in psychology and counts organic chemistry and forensic psychology among her favorite subjects. One of her dream-jobs was a Fragrance Chemist (it’s not too late for an Orange is the New Black perfume, hint hint!). She applies her background and work ethic into researching for her roles. When asked what her must-have items for long set days were, she simply replied “Lip balm!” Dascha describes her off-set look as a combination of “mod vintage” and “comfort”, and looks to curve-loving designers like Carmen Marc Valvo for her red-carpet ensembles. When asked how she met her now-fiancé at the Dominican Day Parade, Dascha jokes she just strolled right up and commented on his freckles! Um, can you throw me a couple of pick-up lines? Shadow me at happy hour? Drinks on me! Dascha stars in Orange is the New Black and also can be seen in the upcoming independent film “Gimme Shelter” opposite Vanessa Hudgens. I can’t wait to see more of her and wish her the best in her upcoming projects! How about you- any new girl-crushes? Leave your picks below! 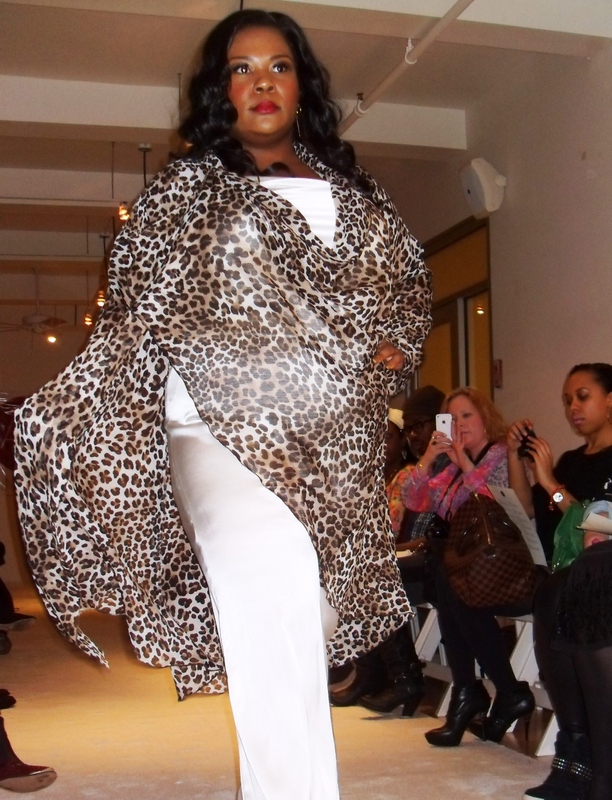 Out & About; BLF Celebrates Full-Figured Fabulousness at New York Fashion Week! New York may have been covered in snow, but that did not stop history from being made during Fashion Week! 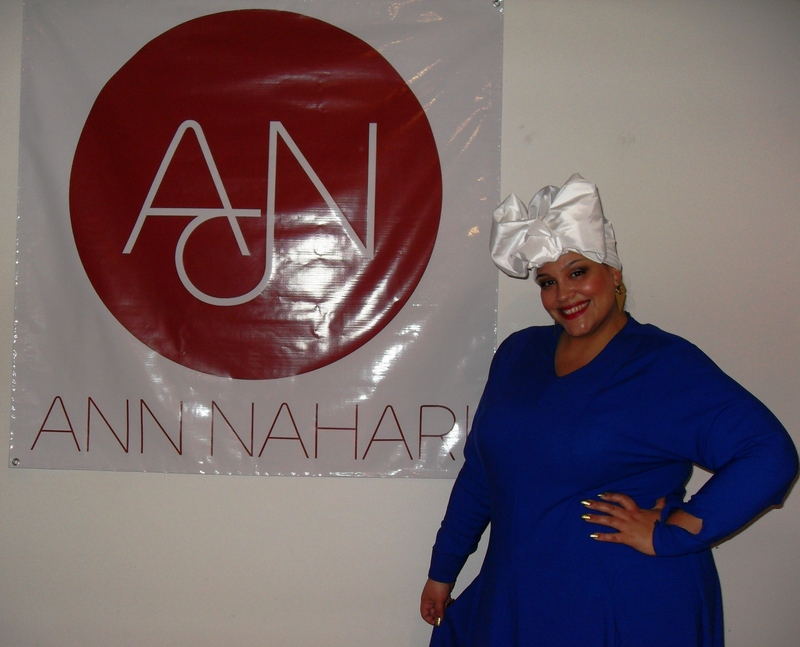 The city was white-hot with full-figured fabulosity as Ann Nahari and Of WHONDER debuted Plus fashion lines for Fall 2013. First up, I had the pleasure of viewing Ann Nahari, a luxe collection with the modest in mind. Proving you can stay true to your beliefs and be fashionable, Muslim designer Sumiyyah Rasheed’s showcase included rich colors, flattering silhouettes and daring prints. 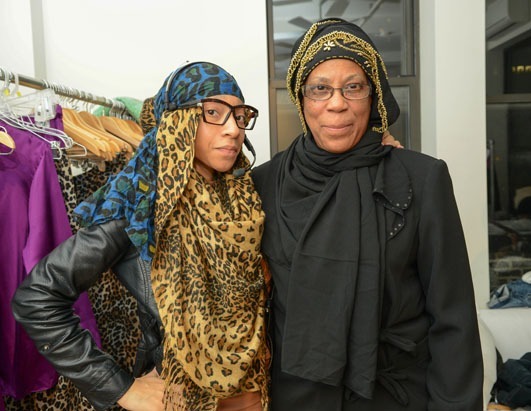 The show was styled by Nailah Lymus of UNDERWRAPS (seen below, with Ann Nahari’s Sumiyyah Rasheed). So glad to see them taking the fashion industry by storm! for more info, visit Ann Nahari or UNDERWRAPS on their websites. Guests were invited to eat, drink and mingle while viewing her 13-piece capsule collection of high-end Plus Wear, which was displayed gallery-style on mannequins in lieu of a live show. The evening’s entertainment was provided courtesy of celebrity guest DJ Valissa Yoe. Of WHONDER paired wispy-light tops with structured bottoms and colorblocked knit pieces with strong colors and shiny accents. This line will undoubtably make its mark in the resort-wear community- I could see her dresses all over the Hamptons! 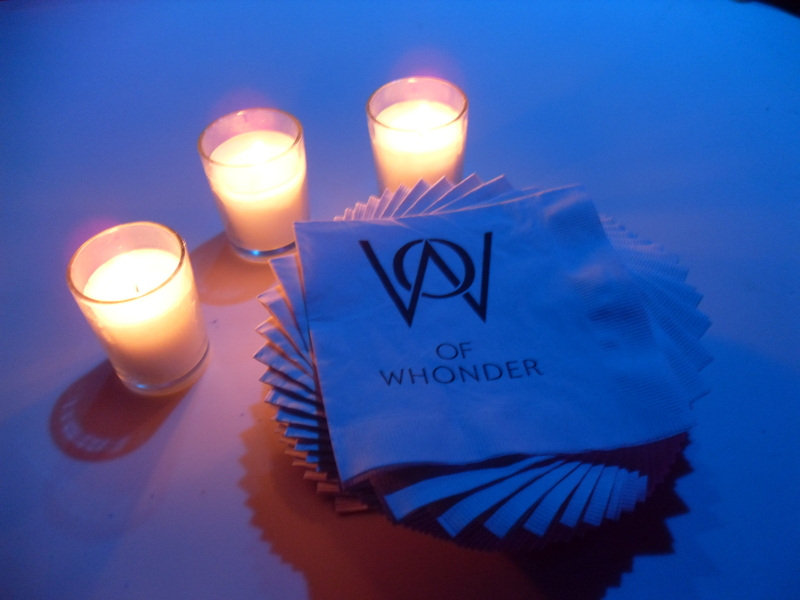 Of WHONDER’ s website is still under construction,but you can click on the photos below to get your peek on the fun! 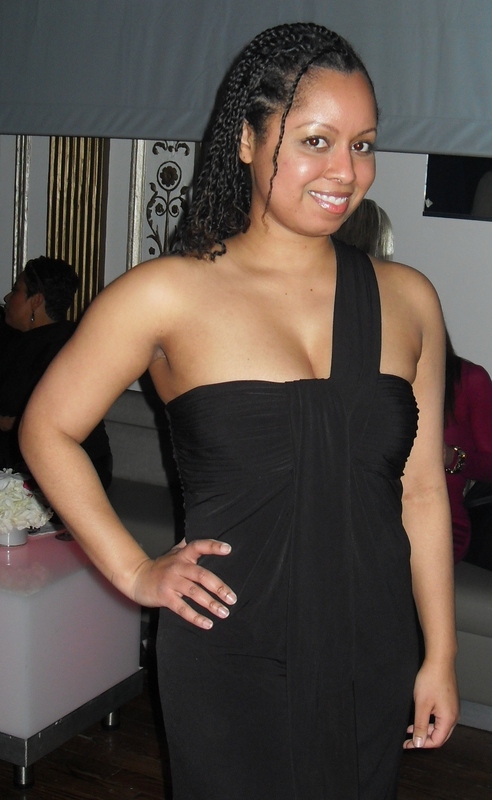 Full-Figured, fabulous, and now socially active, Plus Model industry veteran Christina Mendez blazes into 2013 with the launch of a fan-friendly blog “Happy Curvy You”–a no holds barred ins and outs of the plus size industry! “For years, I’ve been inundated with questions from numerous aspiring plus models asking me how are they able to make it in the plus size industry… so I decided to create my blog “Happy Curvy You” and create an additional supporter fan facebook page to answer all questions dealing with the plus industry (traditional vs. non-traditional) as well as health, fitness, fashion, and life“, says Christina Mendez. You can check out her blog Happy, Curvy You on blogspot or join her Facebook page for your scoop on the Plus-Sized Modeling Industry. For more on Christina Mendez, visit her website. Congratulations! 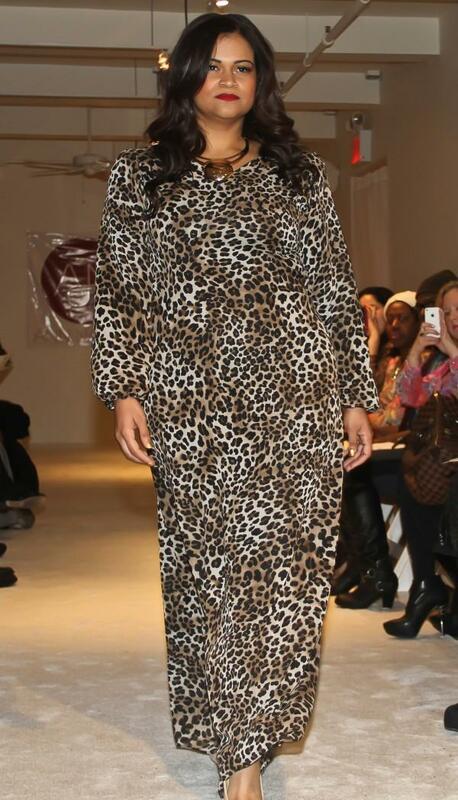 Out & About; More Plus-Size Fashion Week Fun! As I previously mentioned, I had the priviledge of attending several FFFWeek events with the lovely Tamara Walker of The Curvy Socialite. Thursday found me at “Curves, Connections & Cocktails” at District 36 . It was sponsored by Catherines, an “an extraordinary online space designed to give you a voice, celebrate the individual, and connect in the spirit of community”. 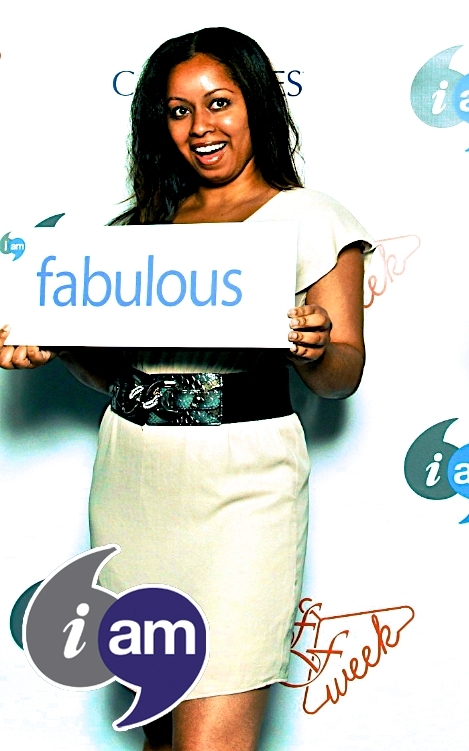 They had a fun step-and-repeat where curvy fashionistas got a chance to showcase their fave personality traits. You can guess which one I chose! Did you REALLY think I’d pick something else? The girls were killing it with the summer fashion looks at the event. 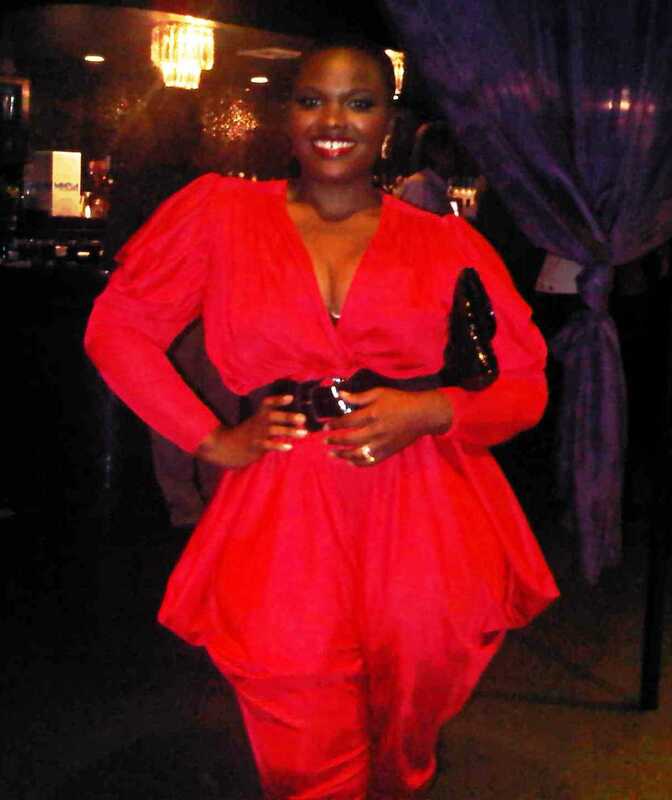 I had a hard time picking my ‘look of the evening’- that is until Domonique Revere of Empress Lingerie came and shut it DOWN with this red jumpsuit! I am in love. Friday was the “Indie Designers Showcase” at the Broad Street Ballroom, and I had the pleasure of seeing my girl Asia Monet do her thing on the runway! It was an expertly produced event and even had a few celebrities in attendance- I sat behind Faith Evans and Syleena Johnson! Fab! Obviously that is not Asia. But I respect the designers, so you get the runway! What I really loved most about my FFFWeek experience was not the fashion or the hob-nobing, but the sisterhood. It was everything that fashion week is not; inclusive, supportive, it promoted comeraderie & sisterhood, there was nary a catty girl in sight- and I left feeling better than when I entered. I applaud FFFW creator Gwen DeVoe for what she has built over the last five years, and wish her every bit of success. If only all fashion could be like this!